New Hampshire is dominated (south to north) by the White Mountains, a northern range of the Appalachian Mountains. 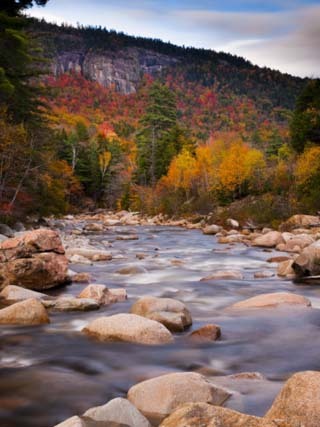 The major peaks of White Mountain range, a series of rugged mountains and narrow valleys, are found within the White Mountain National Forest. New Hampshire's highest point, Mt. Washington at 6,288 ft. is located in that forest. It was at the top of Mt. Washington in 1934, that the world's second highest wind speed was recorded; an incredible 231 miles per hour. The northernmost reaches of New Hampshire - along its Canadian border - are tree-covered forested lands, and home to logging and paper industries. To the southeast of Concord, the Coastal Lowlands front its 13-mile-long Atlantic Ocean coastline. By-products of the Ice Age, many deep, yet small, glacier-carved lakes are found within the state; Lake Winnipesaukee is certainly the largest of these. The state is drained by numerous rivers. The most significant include the Connecticut, running along its entire western border with Vermont, and the Merrimack - the longest river (within) the state. For a closer look at the topography of New Hampshire, view this topographic map.